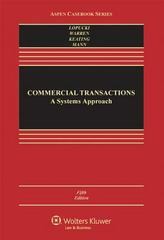 Commercial Transactions 5 Edition Commercial Transactions: A Systems Approach explores the nuances of transaction law from a systems' perspective, examining the infrastructure that supports commercial transactions and how the law is applied in real-world situations. Its outstanding team of co-authors uses an assignment-based structure that allows professors to adapt the text to a variety of class levels and approaches. Well-crafted problems challenge students' understanding of the material in this comprehensive, highly teachable text.All sections of the Fifth Edition have been revised to include new case law and problems, and the 2010 Amendments to Article 9.Hallmark features:Extraordinary authorship all four authors are standouts in the field of secured credit, payment systems and sales law.The Systems Approach examines the infrastructure that supports actual transactions; code is taught in the context of the transactions.Teachable problems prefaced by straightforward textual explanations.Assignment-based organization offers flexibility in teaching.Cutting-edge coverage, including key court cases.The revised Fifth Edition has been thoroughly updated by section:Part One: Sales SystemsAt least 20% new cases.Part Two: Financial SystemsUpdated problems that reflect the types of disputes arising out of the new electronic payment systems.Important new cases, including:Wachovia Bank, N.A. v. Foster Bancshares, Inc.Triffin v. Third Federal Savings BankIn re PTI Holding Corp.Chemical Bank v. Meltzer Data Sales Co. v. Diamond Z ManufacturingBanco Nacional de Mexico v. Societe GeneraleIn re Kang Jin HwangKorea Export Insurance Corp. v. Audiobahn, Inc.Davis v. Stern, Agee & Leach, Inc.Part Three: Secured CreditThe 2010 Amendments to Article 9.